The Dunaway’s are from my husband’s maternal side of the family, specifically his great grandmother Eva. As I look through the family photographs the pictures strike me as having an artistic quality about them and I’m intrigued to learn more about the family. William “Ben” Franklin Dunaway and his wife Lucy Jane Allder married in Dade County, Missouri in 1867 and had 14 children, 9 of whom lived to adulthood. There were 5 girls and 4 boys. One of their daughters, Dr. Jane E. Dunaway, wrote a book entitled Dunaway – Allder – Pyle Family and she says the book is an attempt to introduce her nieces and nephews to the older generation and “give a compilation of social, cultural, education and medical history”. It seems clear that she respected her parents and siblings very much. They remained in close contact with one another throughout their adult lives even though they did not live near one another. Additionally, the family met each July at the El Dorado Springs for the Old Settlers Picnic until their mother’s death in 1939 and I have a few photos from those times. I’ve written of Jane in a previous blog and today I’ve included excerpts from her book that give us a glimpse into the personalities of the Dunaways and their relationship with one another. Ben was a cheerful, buoyant, easy going sort, enjoyed company, always had a ready illustrative story for every occasion. Never knew when mealtime or bedtime came, could read from morning till midnight, seldom being disturbed by the noisy kids, the fire going out, or the elements. Yes, we all went to school, we all got an education and we all went on our own, making our way as we went; thanks to our mother, the motivator, instigator and spark plug for the family, and to our father who lent his moral support. Jane provided quite a bit of information about the education and careers of her siblings as well as herself but today I’m highlighting selections that focus more on the sibling relationships that she mentioned. 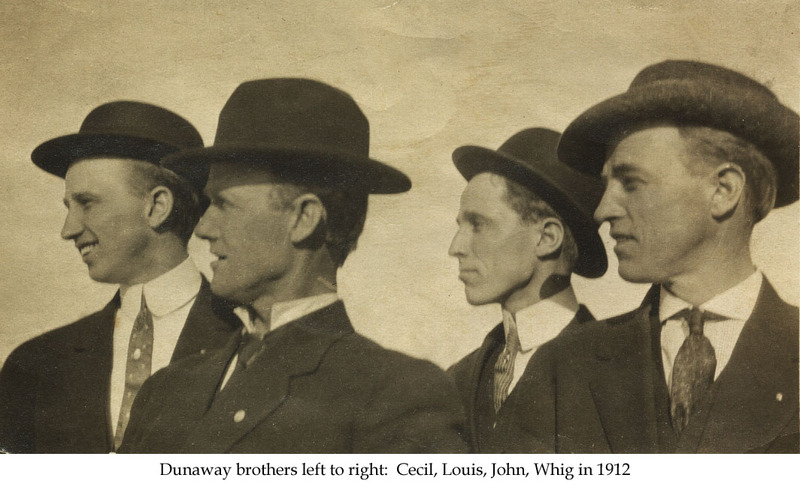 As I learn more about the Dunaway’s personalities I am even more drawn to one particular photo of the brothers and can’t help but wonder what they were doing and thinking when this photo of them all looking to their right was taken. Dr. L. T. – One summer when most of us were home for vacation Dr. L. T. planned a fishing party for Sunday afternoon. This Sunday afternoon business was resented by some of the sisters, Whig (a brother) said: ‘Well, now, personally, I’d just as soon have the piles as to go, but Louis has gone to all this effort and wants to take us fishing, so fishing it will be.’ …Dr. L. T. took a fatherly interest in his younger siblings and was always ready to help or advise. The younger ones held him in high esteem and great respect, more on a plane as a father. Alice…will be ninety this year, 1959. Even at this age she has been very helpful in supplying information from memory for this story. Eva is very loyal to her family. Nearly all of her younger brothers and sisters were weaned from home by the way of her house. She has always kept up with them, wherever, they have wandered on the face of the globe. She, also, keeps up interest in their children and even their grandchildren, some of whom she has never seen. Eva is noted for her Sunday and Holiday family dinners at which there is seldom less than twenty present. Stella grew up to be a young lady, five feet six inches tall, blue eyes and luxurious, long, blonde hair. Stella was very versatile, resourceful, energetic, optimistic, cheerful and understanding. She was always neat, orderly and prompt. While very active mentally, she was not the athletic type because of a (mechanical) floating kidney, although the diagnosis was not made until much later. She could never run, jump and play as other children because of pain. Jane Dunaway chose medicine as a career when that path, for a young woman, was almost completely blocked by obstacles. Two maternal uncles were doctors, as was also a beloved and admired older brother. 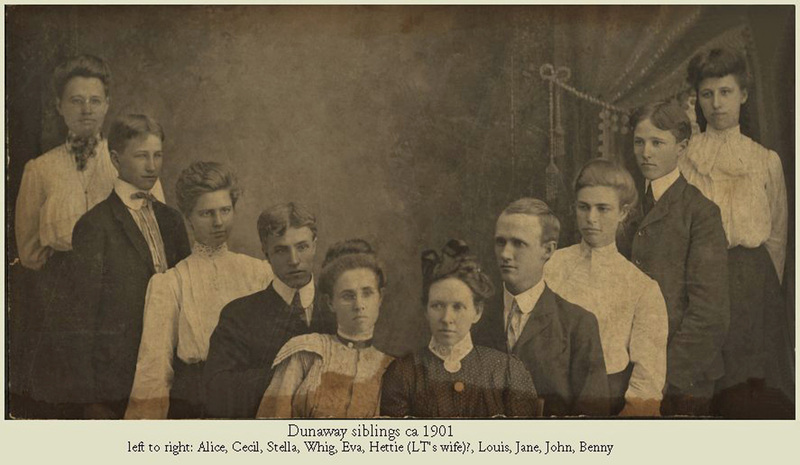 Quite possibly this elder brother, Dr. Louis T. Dunaway, was a strong motivating force in her choice of a career. As she says, “We always did everything together. I could do everything he could do – from acrobatics to breaking and training horses.” She chuckles as she tells of doing a backward somersault off a two-wheeled cart to escape the flashing hoofs of a rebellious animal. Dr. Jane still rides and is an ardent horsewoman. Whig. When not in school and sometimes at school, he worked at whatever job was available, at times with his older brother, Dr. L.T., doing farm work, cattle raising, etc. In the fall of 1905 Whig entered Kansas City Veterinary College, Kansas City, Missouri and graduated in March, 1908. He came out with as much money as he had when he entered. Bennie is active in many ways, has great initiative and creative ability, which she has used in her home and community… Bennie is the youngest daughter of the family, has blue eyes, of course. She is shorter than her four sisters. She usually has five irons in the fire! She loves to entertain, is a natural born leader and is unexcelled in nervous energy. Fall of 1919, John returned home via Yugoslavia at this brother Cecil’s request, to look into some difficulties with the ASR (Armenian Syrian Relief) work which Cecil was directing from the New York Office…John was the second in the family to have Perthe’s hip-joint disease… Fortunately he was more like his father and did not have the compulsive urge for motor activity so characteristic of the rest of the family. As a child he was content to sit and read; the mild ache or pain kept him off his feet, so he managed to get by with a slight limp. He was, also, one of the five to receive teeth injury, having three or four upper front teeth knocked out with a baseball bat, at the age of twelve. So, he went through adolescence ‘toothless’. Cecil was the last of the fourteen children of W.F. and Lucy Jane Dunaway. After attending country schools until he was fifteen or sixteen he went to Noble, Oklahoma, and stayed with his sister, Eva Garee. He was the tallest and most extroverted of this extroverted family, (college measurement, six feet). He is extremely active, hard worker, garrulous, an avid reader, a good mixer. Just to meet Cecil means making a new friend. … He is interested in every topic under the sun and is always ready for a discussion…Cecil is much like his father in his aptitude for appropriate stories which he enjoys on every occasion. Eva’s granddaughter, Irene, remembers her great aunts and uncles visiting often and shared with me some observations of the siblings. “They must have had strong parents, the Dunaway children, for they were all, from what I could tell, quite ambitious. From what I can remember, they got along quite well. Grandma really seemed to dote on them all and when any of them were in Noble she would laugh and talk with them quite unlike the grandmother I was accustomed to seeing. They would tease her and she would laugh. When her siblings would come they would stretch out the leaves to the table and about 12 of the adults would sit at the table while the children ate at a table in another room. They all got along well and respected grandpa. Whig, was a veterinarian and visited most often although Cecil and John visited often also. Whig was a joker with a loud voice. John was a diplomat and served in Persia. Irene thought John was very handsome, funny and had a quiet way about him and often thought that he was her grandmother’s favorite sibling because he was the only person permitted to smoke cigarettes in the house. It seemed that he could do no wrong. Cecil, had a loud voice & laugh like Whig. I don’t remember the other sisters or L.T. being there but they kept in close contact with letters and pictures. All of them seemed to have strong personalities and they would discuss all sorts of things. Aunt Jane was there quite often, it seems, if I remember correctly. She was quite a striking woman and usually wore a cape and a big felt hat of some kind. She and Grandma Garee just seemed really comfortable together, just like regular sisters. For more photos of the Dunaway family, visit My Tree House; for their genealogy visit my WorldConnect site. Artistic is right. Both the v-shape of the siblings and the profiles of the brothers with their hats. Great photos. I wish there was a photographer’s label on them, I’d research that person.